Greetings and happy 2013! I hope you’re as excited as I am for what the new year has to bring. 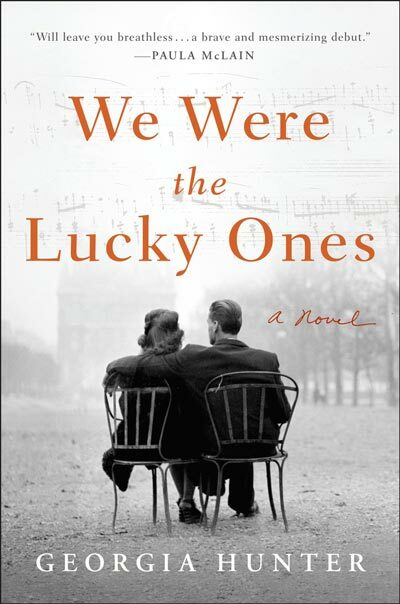 #1 on my list of resolutions this year is to complete a draft of The Lucky Ones by summertime. Wish me luck! I left you last with a snapshot of life for the Kurc siblings in December of 1940. My grandfather was desperate to escape Nazi-occupied France. After being denied visas to America, Argentina and Venezuela (anywhere that would take him in the free world was fine with him—he couldn’t afford to be picky), he was finally able to talk his way into a Brazilian visa; shortly after, he set sail for Rio de Janeiro aboard a passenger ship called the Alsina. With a Brazilian visa in hand, my grandfather set sail on January 15th, 1941, for the free world aboard the S/S Alsina. At the time, Brazil was one of the last countries accepting refugees. The Alsina was overcrowded to nearly twice her capacity. The Alsina never made it to Brazil. It was detained in Dakar, again in Casablanca, and later sunk in an Allied air attack. How my grandfather eventually found his way to Rio, I had no idea. What I did know was that he managed to make the most of his time aboard the ill-fated Alsina. Soon after the ship left Marseille, story has it he charmed his way from his bunk in steerage to the grand piano in the first-class lounge, where he entertained passengers with Chopin etudes and popular jazz tunes—and where he met a girl. And not just any girl—a beautiful Czechoslovakian named Elizabeth, to whom he later proposed. 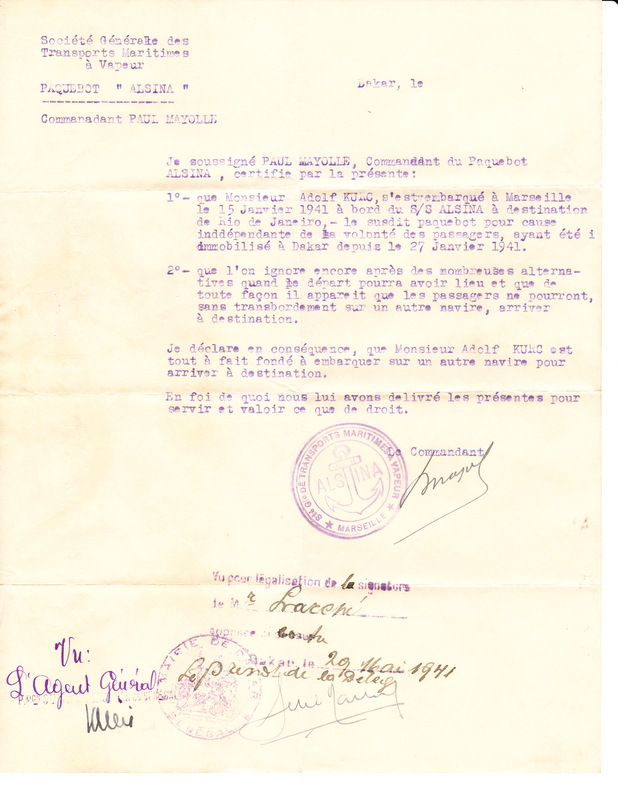 A letter written on my grandfather’s behalf by the captain of the Alsina; the ship had been detained for four months in Dakar when the document was signed. The letter indicates that my grandfather (whose visa was set to expire) should be granted permission to sail to Brazil via an alternate vessel. Perhaps if Elizabeth was still alive, I thought, I could talk with her. I started fantasizing about the questions I’d ask—about the ship, about Dakar, Casablanca, Rio, about my grandfather—of the man he was at 28 years old, having just left his home and his family, without a clue as to what the future might hold. But after scouring the Web, I couldn’t find any record of Elizabeth Lowbeer. 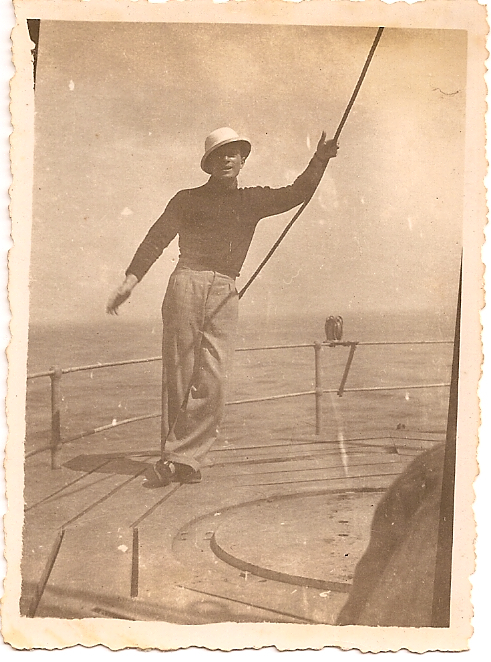 My grandfather, aboard the Alsina, appearing more Gene Kelly than refugee. A week later, an email came— “Adolph Kurc appears on page 365 of my book. He was issued a temporary visa, #51.” Koifman went on to share a wealth of invaluable details about my grandfather’s journey. Apparently he arrived in Rio via a ship called the Cabo do Hornos, where he and a handful of others were detained on an island off the mainland, Ilha das Flores. 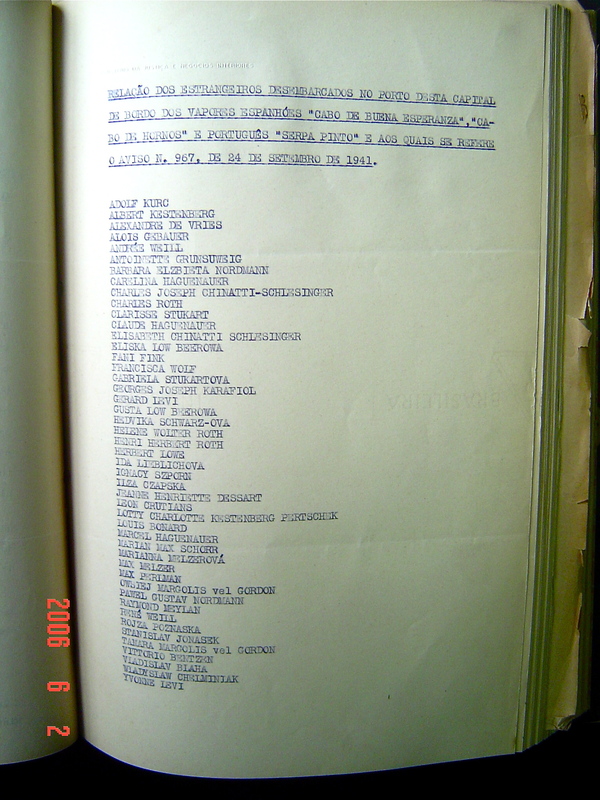 Koifman sent me a list of the detainees (below). My grandfather’s name is at the top. If you look closely, you’ll see Eliska Low Beerowa, fourteen names below. After thanking Koifman profusely for his help, I immediately googled “Eliska Low Beerowa.” It didn’t take long for me to find her. Eliska, married name Chanlett, lived in Chapel Hill, North Carolina. She was 88 years old. A page from Koifman’s book. My grandfather, Adolf Kurc, is first on the list. Elizabeth Lowbeer, a.k.a. Eliska Low Beerowa, is 14 names below. Giddy with excitement, I wrote Eliska a letter, explaining who I was. I’m going to be visiting North Carolina in March, I said. If you have any interest, I would love to meet you. Worst case, I told myself, I wouldn’t hear back. Best case, I would, and she’d be lucid, and open to meeting me, the prospect of which kept me awake at night, wondering what she’d look like, sound like, what kinds of stories she might share. My heart skipped a beat as I dropped the letter in the mail. All that was left for me to do was keep my fingers crossed, and wait.